Arrival – Dig Delve – An online magazine about gardens, landscape, growing & making. Towards the end of 2009, I went to Bath for a signing of my book ‘Spirit’, which had been published earlier that year. It was an opportunity to stay with old friends, Jane and Donald, at their farm just north of the city. We walked the land the next day, through the rubbly holloway with tall overgrown hedges and up onto the high ground that gave way to blustery views of rolling pasture and verdant dells. Despite our proximity to Bath, it was a day of being lost in landscape. In idle passing I mentioned that if anything ever came up for sale in the area, could they let me know. I was finding it increasingly difficult gardening within the confines of a London plot and living vicariously through those of my clients with horizons and room to expand. The feeling had been there for some time and Huw and I had been drawn into looking at land more than once over the years. On a couple of occasions we had got perilously close to buying what I now know would have been the wrong property. The trail had gone cold several years before, though, and we had decided to focus our energies on the design business and our home in Peckham. Being ‘potbound’ had happened before and driven me from my first London garden – a tiny rooftop in Vauxhall – to the long narrow rectangle in Peckham. By 2009 we had been there for twelve years and made the garden into an oasis. Every inch was tended and it was literally bursting at the seams, escaping over the fences and in some cases under them too. Instead of looking inward and planting the surrounding environment out, I wanted to be part of something bigger; somewhere it was possible to let the eye travel and to garden with blurred boundaries. I wanted to be part of a place, a smaller cog in a bigger cycle; one that I might learn to steer rather than have to control in entirety. As is the way when you are truly ready to do something, the thought opened up a possibility. 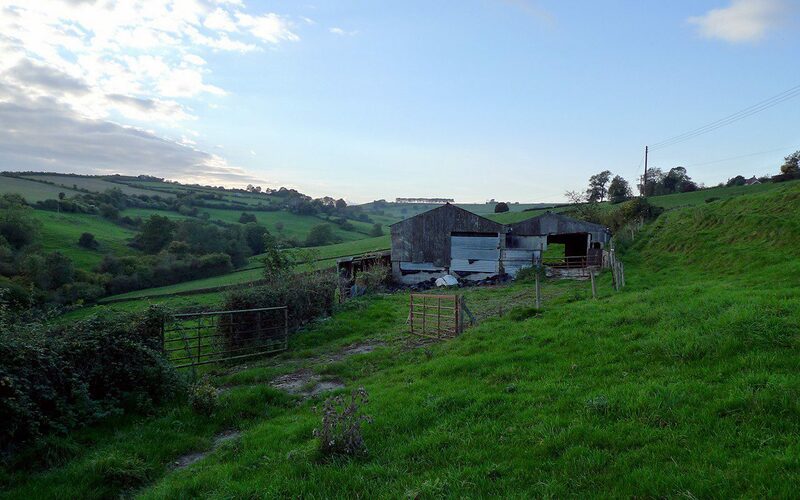 The following February we received a call from Jane with the news that Raymond, the farmer who lived on the opposite side of the valley, had passed away and his smallholding and the little house he had been born in were to be sold. Jane was at pains to say that the house was nothing special, but it was a good piece of land. Just under twenty acres with slopes facing south to meet the shared boundary of the stream at the bottom of the valley. We drove down that weekend out of curiosity, but without any real intention of buying. We only thought that it might help get our eye in again, as we had decided to resume our property search in earnest. It was a morning of bright sunshine, pale blue skies and speeding white clouds that heralded spring. Descending the steep north-facing slope below Jane and Donald’s house we hopped the stile into a strip of tall woodland at the bottom. Crossing the stream at the shallows the skeletal shadows of the tall poplars reached up the hill ahead of us. Not far out of their grasp, and bathed in sunshine, sat the house. Perched alone on a thin contour of flattened ground, it looked like a child’s drawing, flanked to east and west with a patchwork of rickety breeze block, stone and corrugated outbuildings. We were met by Raymond’s brother, Norman, who had been stripping the house and clearing the barns out for sale. He walked us round it all in less than twenty minutes. The house was neat and tidy and had clearly last been decorated when Norman and Raymond’s mother had still been alive – floral vinyl wallpaper, swirly patterned carpets, a chocolate brown oil range in pristine condition and a pink bathroom suite the colour of calamine lotion. But these were of little importance in relation to the land. Looking out from the front door the boundaries were pointed out to us. A steeply ascending rise to the lane behind and a span up the valley by one field and down by three. 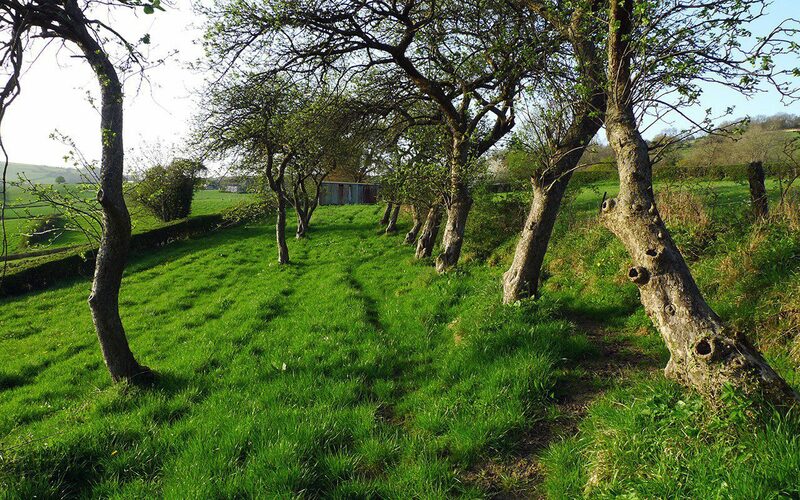 There were two further fields above the lane to the east and in the lower one of these were the remains of an old orchard running along the contours at the base of a steep bank. We walked the boundaries quickly, soaking it in and instinctively feeling a connection. Descending the slopes an hour later, we simply said, “So how are we going to do this ?”. There were no ifs, buts or maybes. No doubt. It was where we wanted to be. I cannot say it was easy. Norman didn’t want to go through an estate agent and wanted the sale completed quickly. We had agreed on a price, but struggled to sell our house in London that spring after the bottom dropped out of the market. Peckham had not yet become the hip destination it is now and we had only three viewings in six months. Consequently the initial valuation, on which we had based our offer for the farm, was severely reduced and increased our exposure financially. Thankfully the third potential buyer recognised the garden from my column in The Observer and fell in love with the place. So, by some miracle, we exchanged that October almost exactly a year after I first put the thought out there. I filled the boot of my car three times over with plants from the garden in Peckham bound for Somerset. It should really have just been one load, since a new garden is always driven by its surroundings, but there were treasures that dated back to my teenage years, rescued favourites from my first serious commission, Home Farm, Molly-the-witch peonies that I had grown to flower from seed, and special plants given to me by friends that I had carried with me from garden to garden. After locking the Peckham door for the final time a momentary sadness lasted for as long as it took to turn the corner at the end of our road and head west. It was as simple as that. The new ground beckoned and we never looked back. We moved in on Halloween weekend, with the autumn advanced and the trees at the bottom of the slope beginning to assume their transparency. Our first night before the removal men arrived was spent in sleeping bags on the freezing floor in front of the fire. Our first morning was marked by the adrenalin rush of opening curtains and seeing the yellowing poplar leaves just visible through the mist rising in sunshine over the sweep of field that fell to the stream, and the realisation that this view was our view and it was every bit as beautiful as we had thought. It is such a distinct feeling, the awareness that comes with the new and each and every detail was vivid and held excitement. Windows, gates and doors secured with baler twine; carpet laid over lino laid on cold concrete floors; a damp stone fireplace that exploded the first time it was lit; the layering of one year’s makeshift solution upon another, the making-do with no more than was necessary. The place was a fascinating calibration of economies, which we were happy to live with for a while – and ended up doing so for five years. It took that long to know what to do with the place and what has felt right here. In the five years since we moved the thing that people most often say when they arrive is, “What an amazing view!’. Raymond would famously respond to this comment by saying, ‘You can’t live off the view.’, but it never fails to excite and inspire me, whichever part of the world I arrive back home from. In my mind the land is remarkable, but it also feels right in my bones. I travel far and wide to look at projects in beautiful places that have taken my clients a considerable search to find. However, I always return with a renewed appreciation of what a special place we too have found, secure in the knowledge that for us it is not just a beautiful canvas, but a place that provides discovery and answers to the search for how to be on the land. From the moment you arrive you look up and out, your eye travelling some distance up the valley to a graphic line of beech trees that score a dark mark on the westerly horizon. We can chart the seasons along this line, the sun setting far to the right of the trees in high summer and swinging around – in what feels like a quarter turn – to somewhere behind the tall poplars immediately in front of us in the depth of winter. The woodland running along the base of the valley below us is backlit by sunshine, which pours down on our south-facing slopes for the duration of the day. 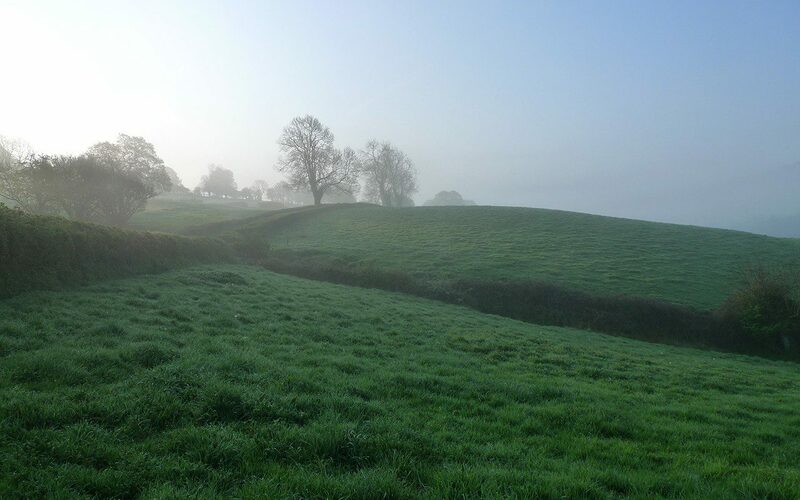 The slopes are steep and the hedgerows run top to bottom, charting the change in the ground, which is rubbly and thin at the top and deep and loamy in the hollow. The house sits on the spring-line, or thereabouts, and the hedges below pick up the springs in ditches at their sides, which run most of the year. In wet years they pop up in the ground around us, scoring brilliant green lines of lush grass in the fields where they are not intercepted. Over our time here, and where Raymond’s makeshift land drains have failed and we have not repaired them, we have become aware of how much time must have gone into keeping the land dry for grazing. I imagine there is a warren of drains that will only be discovered when they fail. The Juncus springing up in the fields is a sign that the land is waterlogged and, as my intention in judicious land management and maximum ecological diversity, where the drains do not need to be mended, we will simply allow the ecology to revert. 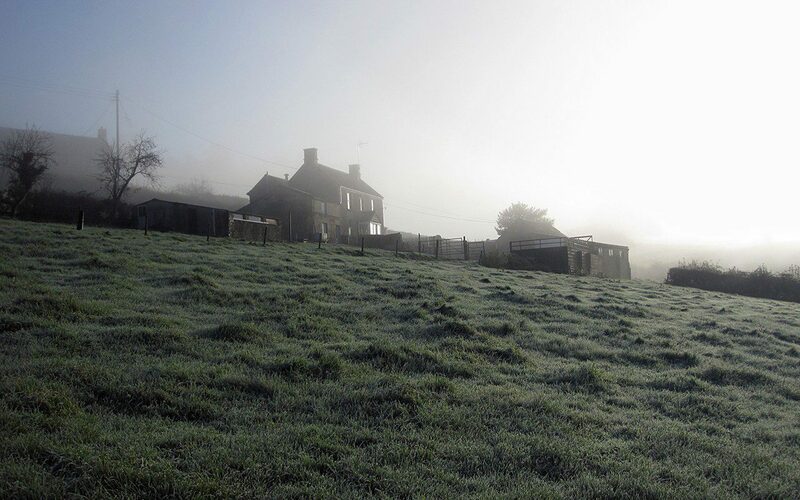 Until the 1950’s, and before the land was grazed to its very margins by Raymond’s small herd of beef cattle, the south facing slopes and the fertile soil here were used as market gardens for Bath. Our neighbour, Glad, who was also born here and who went to school with Raymond, remembers some of the crops. In snippets here and there we have begun to form a picture of how the land was used; of an orchard that was once much bigger than what remains, of cobnuts harvested from trees that grew in the ditch, of lined-out brassicas, of where the best plums grew and of the wilding redcurrants and gooseberries that have found their way into the western hedgerow. Bunches of snowdrops, primroses and violets were gathered for market posies, and two heavy-berried hollies were harvested at Christmas for wreaths. These are some of the clues that have helped us feel our way with how this place should be. These and the wild corners, which I have slowly been extending and allowing room again. There is a roll in the land that not only takes us steeply to the stream, but also pitches down the valley towards a sharp crease where the brook runs. We call this the brook because it is smaller than the stream at the bottom, although this stream is named Lam Brook. 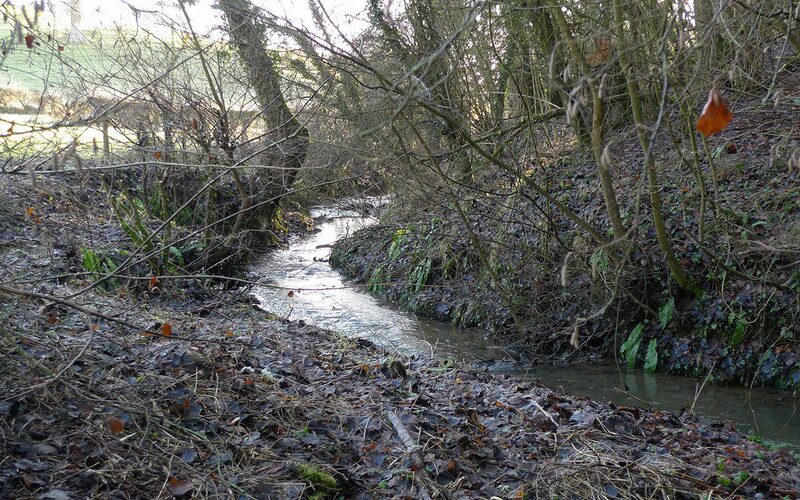 The brook is a constantly running torrent that emerges in the field above the lane, which it crosses underground. It is also fed by boggy ground on the steep slope above to the east, which had the cows knee deep in mud and where a solitary crack willow grows. 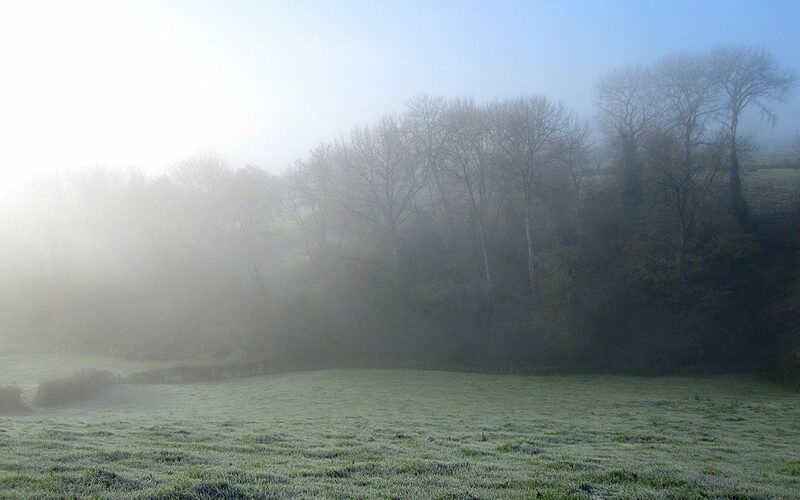 This steeply rising hill, that hampers our view down the valley, is called The Tump. The year that he died Raymond had pollarded a veteran solitary ash here and, although pollards in the fields around us have regenerated as they should, this ash is feeling her age. 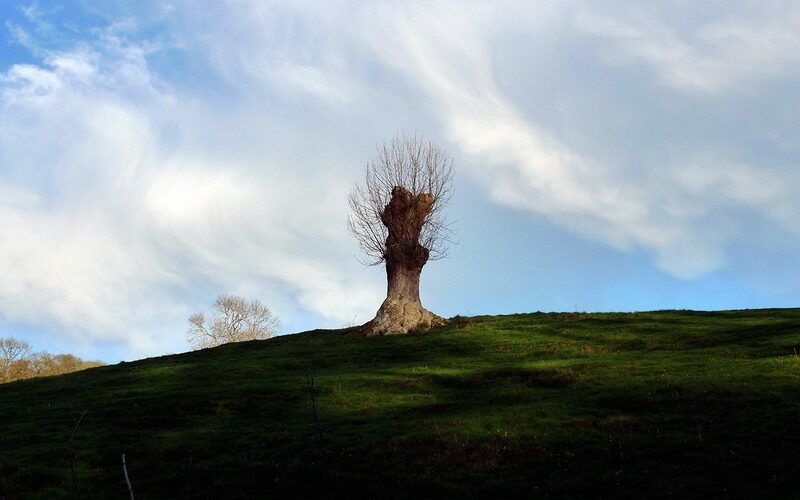 I say her, because the form is definitely female, standing strong and steady against the sky. I was delighted to read recently in Robert Penn’s The Man Who Made Things Out Of Trees that ash is known as the Venus of the Woods, since we have always thought that our pollard has something of the Venus de Milo about her. There is always something distracting going on in the sky because there is so much of it. From almost everywhere we look out and over and up, so it is difficult to think about planting out the views. That, and the feeling of being in the landscape and not wanting to impose a garden, have made it challenging to know how to move forward. Five years of thinking about it and trying things out to see what is right here have slowly made the way forward clearer and it is now time to make a move on a garden. It will be somewhere that has hidden treasure that you find, but which doesn’t shout from a distance. The garden will help us to reveal the possibilities.